Rosh Hashannah occurs on the first and second days of Tishri, commemorating the month in which God created the world. In Hebrew, Rosh Hashannah means, literally, “head of the year” or “first of the year” and is commonly known as the Jewish New Year. The Jewish New Year is a time to begin introspection, looking back at the mistakes of the past year and planning the changes to make in the new year. Rosh Hashannah and Yom Kippur are together known as “Yamim Nora’im”, the Days of Awe, or commonly in English, High Holy Days. On these two days, and the entire month of Elul which precedes them, we are instructed to examine our deeds (and misdeeds) of the past year. The goal of these holy days is to reassess, ethically and religiously, one’s life. Therefore, we do teshuva, translated literally as “turning”. This means turning inward in self-evaluation, turning to look at our deeds of the past year, turning to our friends and family to ask for forgiveness, and returning to God. During this time, it is said that God is deciding whom to inscribe in the book of life for the coming year, and our fate will be sealed on Yom Kippur. The shofar is a ram’s horn which is blown somewhat like a trumpet, and 100 notes are blown each day, provided the holiday does not fall on Shabbat. Hearing the shofar is considered one of the most important observances of this holiday, and it is suggested that this sound is a “wake up call” for us to consider our actions and repent. There are four types of shofar notes: tekiah, a 3 second sustained note; shevarim, three 1-second notes rising in tone, teruah, a series of short, staccato notes extending over a period of about 3 seconds; and tekiah gedolah (literally, “big tekiah”), the final blast in a set, which lasts longer than the others. 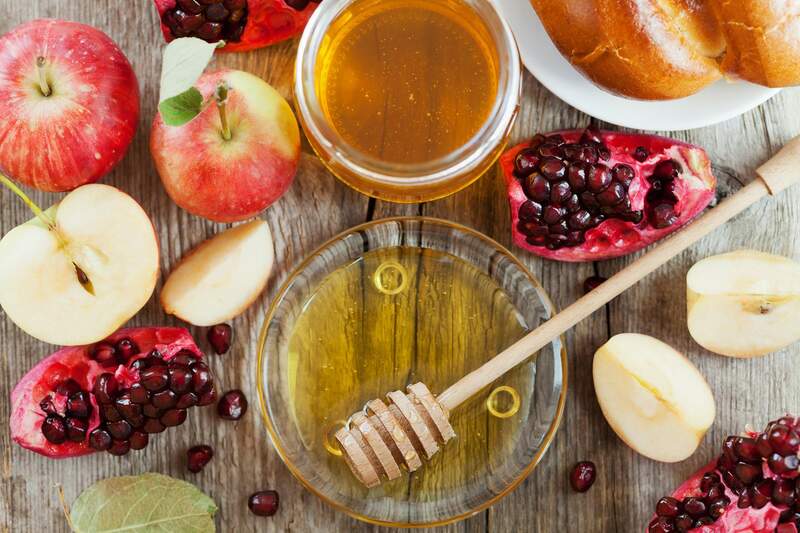 A popular custom during Rosh Hashannah is to eat apples dipped in honey, a symbol of our wish for a sweet new year. We also eat round challah, to symbolize a well rounded, good new year, and also dip the challah in honey. Other popular foods are fish, symbolizing fertility, and many people eat a new fruit of the season, saying the shehekheyanu, to acknowledge the new year. Another popular practice of the holiday is Tashlikh (“casting off”). After the Musaf service, we go to a body of flowing water with bread crumbs, which symbolize the sins of the previous year. Taking the crumbs from your pocket, cast them into the water, reciting Pslams. This practice was developed in the thirteenth century and its practice has grown over the years as it provides time for quiet reflection in a natural area. Tashlich – literally “casting off”. Ritual of emptying pockets of breadcrumbs into a river to cast away sins. Teshuva – Literally “turning”, repenting, asking for forgiveness, acknowledging our wrongdoings. Yom Kippur – the holiest day of the Jewish year. Yamim Nora’im – “Days of Awe”, or High Holy Days. Rosh Hashnanah to Yom Kippur. Yom Ha Teru’ah – the Day of the Shofar, another name for Rosh Hashannah. Yom ha Zikaron – the Day of Remembrance, another name for Rosh Hashannah.